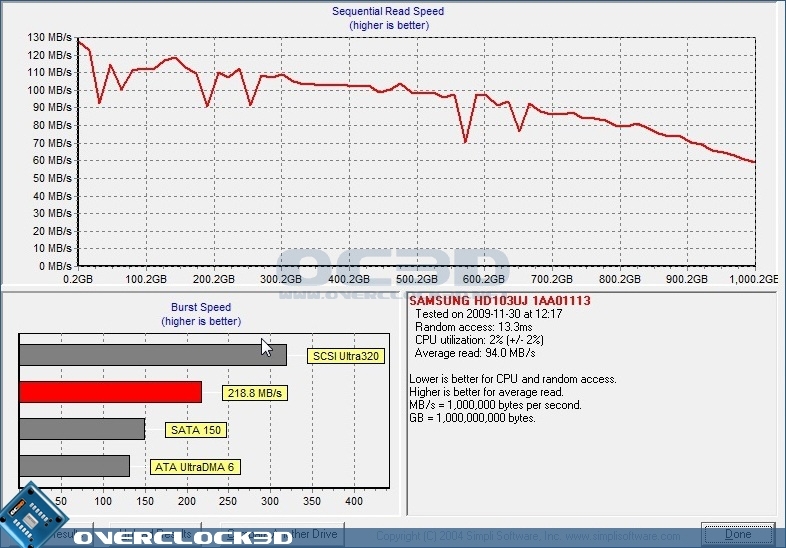 HDTach isn't the perfect benchmark for testing SSD drives as the results can be sporadic under certain circumstances. However, the benefit it does have is providing a result that is very clear to understand, especially in terms of pure sequential data read performance. 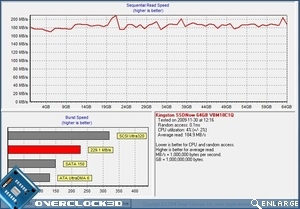 As you can see from the graph on the left, the Kingston SSDNow V+ stays around the 200MBps mark, which is very good for a drive around this price point. It also highlights the main benefit of SSDs (pure speed aside) in that regardless of where the information is held, the speeds returned are the same. 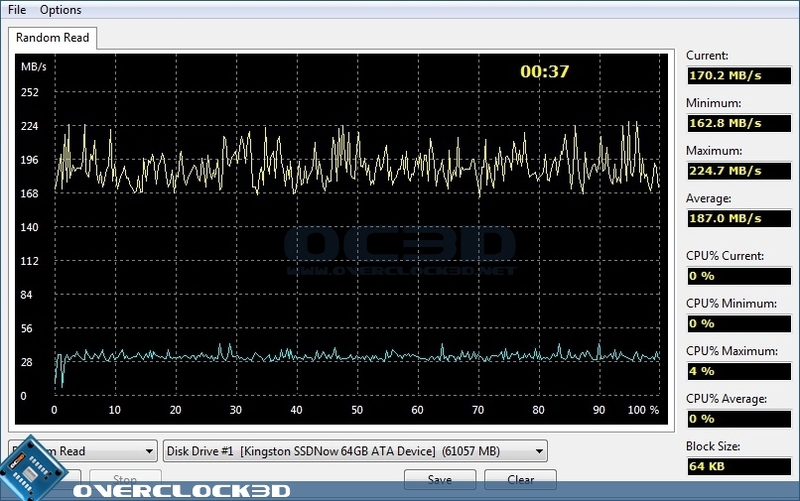 In contrast the F1 remains typical with all platter drives in that it starts able to read the data quite quickly, although please note that the scale on the vertical axis is different to the SSD graph, but very obviously slows as the data moves to the outside of the disk. Lavalys' Everest provides a better method than HDTach for testing the latest high-performance storage solutions. For the purposes of this test both the Samsung and Kingston were put under the Everest Random Read test. The Samsung results approximately mirrored those of the ATTO read test below, but as the graph is so jumbled as to be no use it has been left out for clarity. 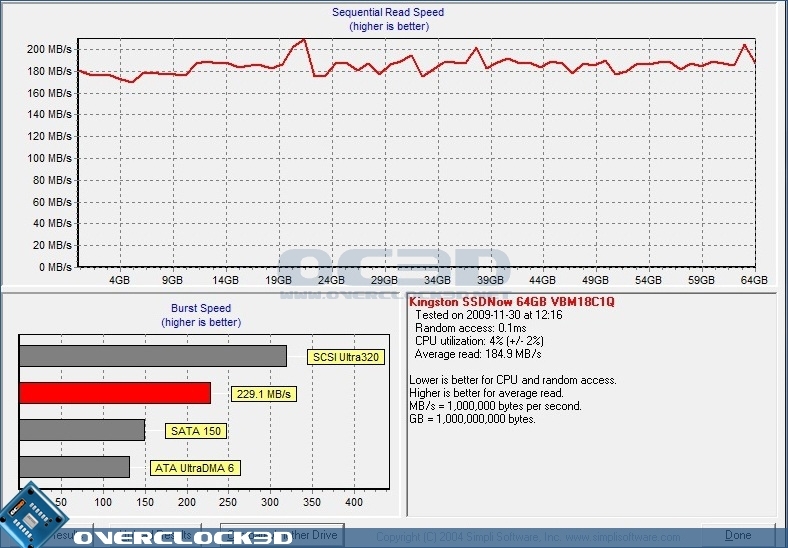 The Kingston SSDNow V+ provided a very stable result across the entire drive with the peak read speed surpassing the magical 220MB/s barrier, and with the minimum read speed obtained only going down to the 162MB/s mark, another very impressive result for the Kingston here. 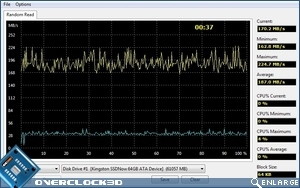 The ATTO benchmark tests multiple sizes from 512bytes all the way up to 8MB. However, really the important tests are tiny files and the largest one, as there isn't much performance difference to be seen between a 1MB file and a 8MB one. The tests were run three times and the average result calculated. As you can see from our results the Kingston SSDNow V+ got within 2MB/s of the potential read speed of the Samsung layout with the 8192KB test, and the write speed even surpassed the manufacturers claims of 140MB/s in both the 8192KB test and the 32KB test. Highly impressive. Nearly double the performance of the Samsung in both read and write testing should help dispel the doubts of those who cling to their platters. If the read speeds are impressive, the write speeds are fantastic. So far in the theoretical tests the Kingston has performed as well as could be hoped. Whilst some of the sustained speeds haven't been as impressive as very high-end SSDs, nonetheless it's proving that under ideal conditions it is exceptional value. On the next page we'll look at the last synthetic before moving on and seeing if PCMark's benchmark suite shows that these speeds are obtainable in actual use conditions.